We have an addiction problem. The craving for P goes right down to our bones and DNA. I’m not talking about methamphetamines, but phosphorus. We are about 1% phosphorus, by weight. Written as ‘P’ in chemical shorthand, it is an essential building block for proteins and bones, and central to our internal energy production. While we could suffer from osteoporosis or hypertension with too much, too little and we might experience bone pain and weight loss. Our addiction is genetically encoded. Plants are addicted to P too, but it’s not readily available in the environment. It doesn’t have a common gaseous form like carbon, oxygen or nitrogen. When on the Earth’s surface, it is generally just headed for the next geological burial ground, where it would wait to be uplifted tectonically before again seeing the light of day. But as humans have increased in number, seeking ever more food from the land, we have short circuited P’s biogeochemical cycle. We have excavated it from guano-encrusted islands and igneous rocks around the world, to be packaged into fertiliser for our farms. While fertilisers have provided us with more nourishment, it has done the same for natural ecosystems. The P that is applied to farms doesn’t all stay there, nor does the P that we eat. Much of it makes its way to streams and lakes where it fertilises more growth, more photosynthetic production. And just as too much P causes problems for human health, so too does it cause problems for streams and lakes. 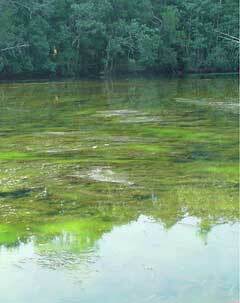 High levels of P in freshwater ecosystems tend to support higher amounts of algae. But if their numbers are not kept in check by being on another critter’s menu, they will change the demographics of the freshwater ecosystem. Fewer trout. More aquatic weeds. Even a greater incidence of neurotoxins from algal blooms. This is what eutrophication is all about — an abundance of nutrients, and from some perspectives, an over-abundance. Eutrophication is the obesity epidemic of inland and coastal waters. What that means to us is less fishing, less swimming and generally less enjoyment from natural ecosystems. Eutrophication was recognised as a pollution problem in the mid-20th century. The main culprit then being localised discharge from waste water treatment facilities. Around half of the lakes in developed regions of the world have since been identified as eutrophic, but now the problem has shifted from waste waters to agricultural runoff — from ’point’ sources to ’non-point’ sources. P is not the only element at play, though. Nitrogen (N) also brings it share of problems. We’ve short circuited the nitrogen cycle as well, but it tends to have a greater impact on coastal ecosystems. Our addiction to N is another story for now. Just as we seek ways to control methamphetamine abuse, we also look for ways to reduce the overdose of P to streams and lakes. A laundry list of actions taken have been reducing or removing P from laundry detergents, better management of waste water treatment, buffers of plants along stream banks, moderated application of fertilizers. Anything that reduces the amount of P that gets into the environment. The list is long, and under continued scrutiny by scientists and policy makers. So by now you should have a good overview of our other P addition problem, the science that connects our biological needs for phosphorus to ecological and human consequences, and the policies that aim to balance the ledger of agricultural productivity and environmental health. Consider this as you read that news article about stream quality, as you walk by a nearby lake, or as you eat tonight’s dinner. Farmers use Phosphatic fertilizers to grow more crops and these are consumed by people and cattle. I am not sure if you have noted the contradiction in nature’s response to high P level in water. Why does more algae lead to fewer trout and not to more trout? We believe this is because the algae that grows naturally in polluted water is not the right type of algae – in fresh water usually Cyanobacteria blooms and in oceans Dinoflagalletes bloom. We have a solution to this – if Diatom Algae are caused to bloom, the problem of eutrophication will be mitigated. Diatoms increase Dissolved Oxygen level and are the preferred food for Zooplankton and these for fish and shrimp. We cause a controlled and steady bloom of Diatoms by using our patented micro nutrient powder – Nualgi. This contains Silica, Iron, manganese and other micro nutrients – all in nano size for easy absorption by the micro scopic diatoms. Yes, there are advantages of blooms based on silicon-requiring diatoms, hence your first ingredient. I would certainly be very cautious about applying such a cocktail to natural ecosystems, though, even an amateur mixologist as myself. I bet there would be surprises in terms of how the whole food chain reacts – either in the water body or in associated riparian/terrestrial ecosystems. I also expect it to be far less effective in streams than lakes, given the residence times and dilution. All that said, I wouldn’t purport to know all the literature on this facet, and I’m sure it’s a vigourous area of research.